Israeli defense electronics company Elbit Systems Ltd.’s unmanned aerial vehicle (UAV), Hermes 900, has been purchased by four different militaries in Europe and Latin America, Israeli daily Walla reported on Thursday. Two of these armies have already put the Israeli drone into service, Walla said. The Israel Defense Force also has plans for the homegrown UAV, with several systems having been purchased by the Israeli military for a variety of missions including marine monitoring missions. 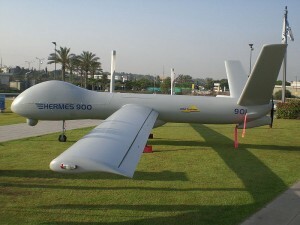 According to Elbit, the company has been producing one Hermes 900 per week for the last year. Elbit’s flagship UAV is renowned for its durability. The Hermes 900 can fly in extreme weather conditions, has a maximum altitude of over thirty thousand feet and can carry a wide range of payloads to meet its operators’ needs. The drone also has automated take-off and landing capability, according to Israeli online news service Globes. The Hermes 900 has a wingspan of about forty-nine feet and weighs 2,190 pounds. To date, Hermes drones used around the world have racked up an impressive five hundred thousand flight hours, of which eighty five thousand were accrued in Afghanistan, as part of the British army’s ‘Project Lydian’, Walla said. While the current version of the Hermes 900 has impressed foreign armies around the world, Elbit is now developing new capabilities for its UAV including the possibility of system operators being able to control two aircraft simultaneously, Walla reported. The next generation Hermes 900 will also be able to incorporate electronic countermeasures in response to threats, which will significantly improve the survival capabilities of the UAV. In the next two months, the Hermes 900 is expected to be delivered to two new customers, Walla reported. Read other Algemeiner articles by Jerusalem Correspondent Gidon Ben-Zvi here.